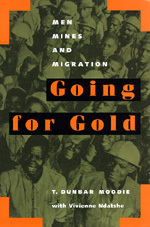 This book tells the story of the lives of migrant black African men who work on the South African gold mines, told from their own point of view and, as much as possible, in their own words. Dunbar Moodie examines the operation of local power structures and resistances, changes in production techniques, the limits and successes of unionization, and the nature of ethnic conflicts at different periods and on different terrains of struggle. He treats his subject thematically and historically, examining how notions of integrity, manhood, sexuality, work, power, solidarity, and violence have all changed over time, especially with the shift to a proletarianized work force on the mines in the 1970s. Moodie integrates analyses of individual life-strategies with theories of social change, illuminating the ways in which these play off each other in historically significant ways. He shows how human beings (in this case, African men) build integrity and construct their own social order, even in situations of apparent total repression. T. Dunbar Moodie is Professor of Sociology at Hobart and William Smith Colleges and the author of The Rise of Afrikanerdom (California, 1975). Vivienne Ndatshe is a former teacher who now works as a domestic servant. She grew up in Pondoland, where her father was a migrant gold miner. Her interviews with mine workers and their families added an essential dimension to this work.